Fancy a new torch for camping or just to have sitting around the house for when you need one? This is ideal. 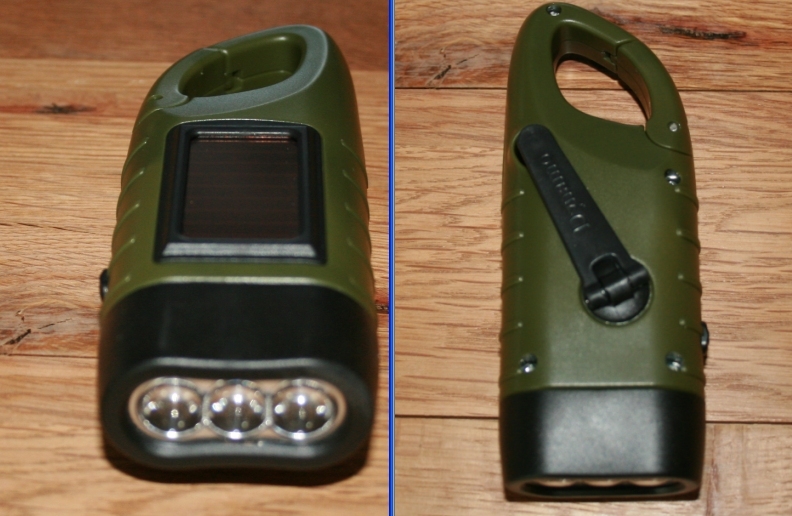 It is a hand sized torch with charging from either the solar panel or a flip up dynamo handle on the back. If you look carefully at the left side of the torch, you will see a small hinge and a break in the loop. This is a clip like that commonly found on mountaineering equipment for looping rope around. The handy clip makes the torch ideal for clipping onto poles, ropes, pegs, hangers – anything really – whatever you have available. I have bought the torch so that I can have it stored under the stairs in that annoying cupboard which doesn’t have a light. So for me, the solar charger won’t really come in handy. I need it there for doing the electrical meter readings from time to time and never seem to have a torch handy when I need one. You will notice the on/off switch on the side there – the torch charges via the solar panel when this is in the off position. The light is emitted from 3 large LED’s in the head of the torch. As seen below. The problem with reviewing a torch is that no matter how hard I try I can never seem to get the desired effect when photographing such a gadget in the dark. Torches simply do not lend themselves to showing how bright they are in a dark room via a photo. You will just have to believe me when I tell you this is more than bright enough for rummaging around a tent at night or crawling under the stairs to read your meter. How to Charge the Torch Battery (solar or dynamo). 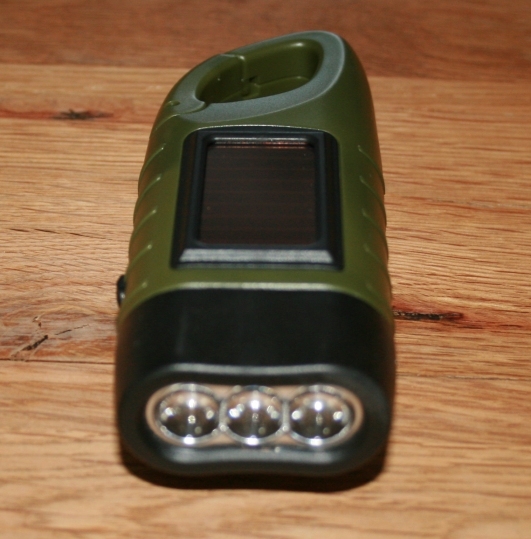 To charge the battery in this Simpeak torch you have two options available. The first option is to simply leave the torch in the sunshine for a while and let it soak up some of those glorious great british sun rays. (It will also charge under artificial lighting – but slower). 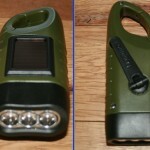 To charge the battery to absolute full capacity, it should be left in the strong sunlight for around 40 hours, which is a long time to say the least, however what you have to bear in mind is that just 30 minutes of charging the torch via the solar array will provide around 10 minutes of light. 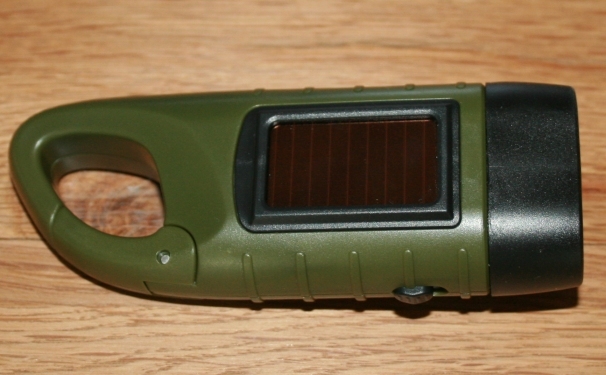 The other way to recharge the battery in the torch is to wind the crank handle on the back (see the image below). The crank folds out and to help you turn it, it has a small handle on it for gripping as you rotate. Charge goes in much faster via the cranking dynamo mechanism, with an 8 minute light ability after only 1 minute of rotating the handle. This torch also comes with a stunning 5 year warranty! Regarding the build, it has a solid heavy feel to it, I have recently purchased a couple of other torches (I seem to lose them a lot) and they are flimsy – even though they are metal cased, they just feel cheap. 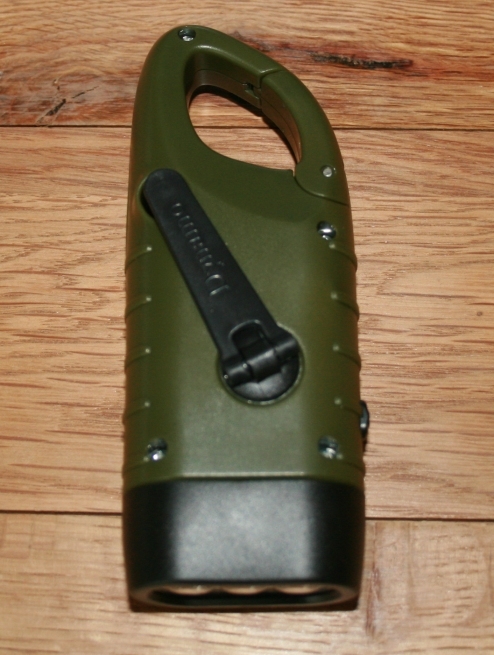 The Simpeak torch feels strong and tough so good for camping aswell as indoor use. It weighs in at 86g – so you will get what I mean by weighty, you know you have something good in your hand when using it. The torch beam is bright for a small flashlight of this kind, and as mentioned, you will not have any problem reading or locating things in the dark at a good range of around 20 ft I would say. All in all, a great little torch and a good addition to the household gadgets!